RoboSavvy Forum • View topic - How to attach the other side of the servo? How to attach the other side of the servo? I'm just getting into the hobby, and trying to make sure I don't invest too much in the wrong direction. My current quandry is this: standard-shaped servos have a control horn on only one side; the other side is smooth. How do you attach *both* sides of a joint to such a servo, so that you're not putting undue lateral strain on the servo shaft? I've studied the pictures of lots of real Robo-One bots in Japan, and they've all solved this somehow. I know some of the higher-end servos have a special shape or add-ons (e.g., the RN-1 servos can come with idler horns). But I can't believe they're all using those. I'm also aware of the LynxMotion brackets, but those seem substantially bulkier and (to be blunt) uglier than what I'm seeing on the Robo-One competitors. So... any insight on how those guys are making a pivot point on the back side of each servo? You are going to want some kind of idler horn or similar idea. The idler horn idea used in the RN-1 works... decent, but a better way to do this is with a bearing, which is how the robotis servos do this. So besides having a motor shaft that can drive all the way through the servo (which i have not seen) an idler or bearing is the way to go. hivemind wrote: You are going to want some kind of idler horn or similar idea. Yes, I understand that, and I do appreciate the reply. But I'm asking how specifically most of the Robo-One competitors do it. They're not all using RN-1 servos, are they? Are idler horns available as add-ons to a standard servo? If so, I haven't been able to find them. Can you point me to a source? King Kizer, it looks like the brackets are connected directly to the servo case -- but of course that's impossible. How do they do that? That is one big robot . The apearance of the slim servo idler is just an affect of the size, it's deceptive. if you go to page 41 here you can see that there is a bearing that serves the purpose of the idler, and these are the best servos out there, so it is clearly the way to go. I know that if I had a lot of money and could afford to go to Robo-one that i would use these servos. hivemind wrote: if you go to page 41 here you can see that there is a bearing that serves the purpose of the idler, and these are the best servos out there, so it is clearly the way to go. I know that if I had a lot of money and could afford to go to Robo-one that i would use these servos. Wow -- me too, but at $90 each, I can't afford even one, let alone 20. That's why I was hoping there was some common solution for using standard-shaped servos -- that way I can start with inexpensive ones like the HS-422, and later replace them with higher-power ones of the same shape. But it may be that most of the Robo-One competitors are simply using the higher-end, nonstandard servos that offer some sort of idler or bearing. 1. Where'd you get (or how'd you make) that nifty support shaft shown in bing5.jpg above? 2. Bing5.jpg?!? Your web page only shows up to Bing 2. 3. You mentioned that you couldn't find any suitable servo-mount gears. Have you seen these at ServoCity? Thanks! I'm completely starting from scratch on a new version. it's just a piece of 1/4" diameter threaded spacer that is bolted onto the aluminum plate from behind. The plate is attached to the servo back through the existing bolt holes. Yeah, that number is just the photo number. Bing 2 has been abandoned and now I'm working on Bing 2A. I do remember looking into those. If my recollection is correct, the spline is actually a plastic insert into the metal gear, which I was afraid would strip. At over 90mm long, it seems kind of big. 5 kg-cm of torque isn't that great either, though running at a higher voltage would get more. Putting in a stronger motor like you suggest could be a good option, but then I'd start to worry about that plastic final gear stripping. They certainly are attractively priced though! DerekZahn wrote: it's just a piece of 1/4" diameter threaded spacer that is bolted onto the aluminum plate from behind. The plate is attached to the servo back through the existing bolt holes. That's very clever. I've been collecting solutions to this problem, and this is solution #7 -- and so far my favorite. It's simple, looks strong, and doesn't permanently modify the servo. DerekZahn wrote: At over 90mm long, it seems kind of big. 5 kg-cm of torque isn't that great either, though running at a higher voltage would get more. Putting in a stronger motor like you suggest could be a good option, but then I'd start to worry about that plastic final gear stripping. They certainly are attractively priced though! Yeah, that's about how I feel about it too. It would probably force a biped to be a good 50% taller than a standard Robo-One bot, though that's not necessarily a bad thing. I too worry about stripping the plastic gears... though it only has three of them; I suspect you could replace them with metal ones as needed and still come out substantially cheaper than a high-torque servo. I suspect I'll pursue that approach for my own biped someday, but I'm also going to try out this threaded-stud technique you've shown for some servos. There's certainly room for both approaches. I opened up a servo for the first time yesterday (yes, I'm that green!) and imagined applying this technique. On my servo at least, the threaded part of the bolts isn't very long. Also, the existing back plate has recesses for the bolt heads; the new plate, of course, doesn't have these. The result is that the bolts are now maybe 0.125" less deep into their threaded holes inside the servo. Have you observed this causing any problems with the servo case pulling apart under stress? Or have you replaced the original bolts with your own longer ones? Also, it looks in the picture like the aluminum plate is flush with the servo backplate. How'd you manage that, if the spacer is bolted onto it from behind? Did you put a taper on the hole so the bolt head could sit flush? For the bolts, I replaced the stock bolts with longer 2-56 machine screws. These are a bit bigger than the stock ones but a little muscle with a screwdriver makes them cut their own threads through the existing ones. I haven't had any trouble with them failing. 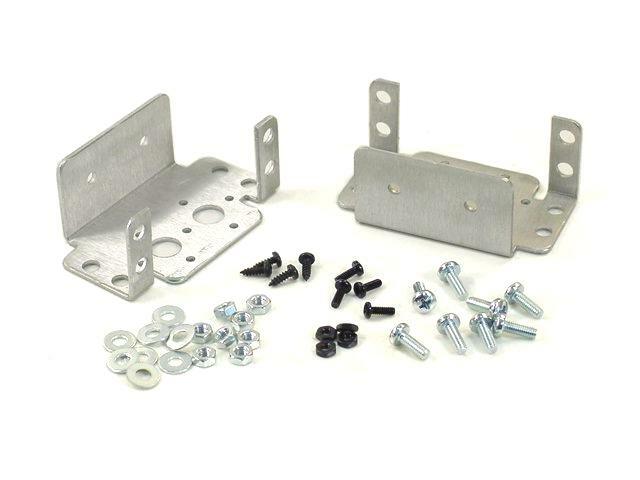 It would be possible to use a low-head flat bolt for the spacer mounting like you suggest. I just drilled a hole in the back plate for the head of the screw to poke through though. In both cases, the changes to the servo case are irreversible, but that didn't bother me in particular. Well, thanks for the explanation! Knowledge is power. It's still a good technique, but you're right, it now goes in the bin with several others that involve permanent modifications to the servo case. That doesn't make them bad... just makes me think a little more carefully before trying them. In a way, it's kind of fun that there is no standard solution to this problem. Apart from people buying stock brackets (e.g. Kondo or LynxMotion), it almost seems like everyone has solved this his own way. That's fun, because it indicates that the hobby is still maturing, and I'm not too late to get in on the exciting part! ServoCity coming out with a solution! I just got word from ServoCity that they're producing a part to address this very problem, which should be available in about a month. It will work with any standard-sized Hitec servo. I can't wait to see what they have to offer. Sheesh, a week ago I had no idea, now I have a plethora, including two commercial solutions! So in addition to the forthcoming ServoCity solution, I just now stumbled across an already-shipping part from Lynxmotion that solves this problem as well. I'm still looking for some details about it, but basically, it fastens on to the bottom of the servo and provides an idler axle. They have ball-bearing versions, too, and they come in several sizes. Here's the catalog page — scroll down to the bottom to see these things (which they call "servo hinges" for some reason). And here's the thread where I'm hoping to get more detail.